A labeled high resolution image of the entire region can be found here, thanks to Sakib Rasool! There are many uncatalogued nebulas. Below you see narrowband Halpha emission line images. 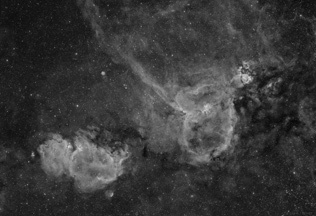 On the left, an interesting and rarely imaged supernova remnant (HB3) can be seen while on the right the whole 4-frame mosaic of the Heart and Soul Nebula is shown. 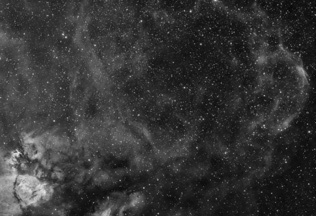 For the mosaic, the right side unfortunately had to be cropped (just the part where the nice shock front is) because I initially did not kown that there was such a supernova remnant (until Sakib Rasool mentioned it by coincidence). Below you find two additional crops at 400% and 150% resolution. One shows an interesting ring structure, the other shows the two galaxies Maffei 1 and 2.